As Microsoft has released major Windows 10 update in the November 2015 known as Windows 10 Fall (build 1511). In this new major update it is found that the users of ESET antivirus found their antivirus software has been removed after the update of their windows 10 to the latest November update. So be carefull before you apply this new update. The reason behind this is due to the incompatibility of the older version of the ESET products specially Endpoint antivirus, Endpoint Security, Node32 Antivirus and Smart Security running on the system. If an users update running old version of the antivirus, Windows 10 will automatically disable that and use the inbuilt Windows Defender as the security software. 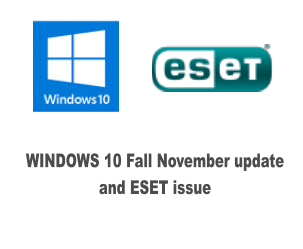 ESET team advised to upgrade their antivirus software before taking place windows 10 update. It will solve the issue and users can upgrade or update without any hassle. If you have already upgraded to windows 10 and ESET get disappear or causing some other error. First step is to update the ESET to the latest version. Most of the issues will be resolved by updating to the latest version. But if still you are facing issues then please contact ESET customer care or refer to the above referred KBs.